What are those tiny spheres doing as they move across that slide? They're doing the breaststroke. Rice University scientists have discovered what may be the simplest form of locomotion in the travels of micron-scale particles linked and driven by a magnetic field. In the Rice lab of chemical and biomolecular engineer Sibani Lisa Biswal, researchers placed magnetized spheres of different sizes into a solution. When subjected to an "eccentric magnetic field," the spheres self-assembled and the smaller spheres, attached by virtual hinges, traced rough orbits to one side of their larger partners. In essence, the small beads replicated the motion of a one-armed swimmer doing the breaststroke. The researchers found they could manipulate the magnetic field to direct swimmers through the fluid at nearly a micron a minute. The ability may eventually make them suitable as drug-delivery vehicles. The phenomenon is the subject of a paper in the Royal Society of Chemistry journal Soft Matter. "There's been a great deal of recent interest in active matter and systems that show collective behavior," Biswal said. "We're used to seeing this in how birds flock or bacteria swarm, but now we can see it in synthetic materials that also show an ability to couple with each other. "Magnetic fields have emerged as a way to be able to drive particles to do some interesting things," she said. 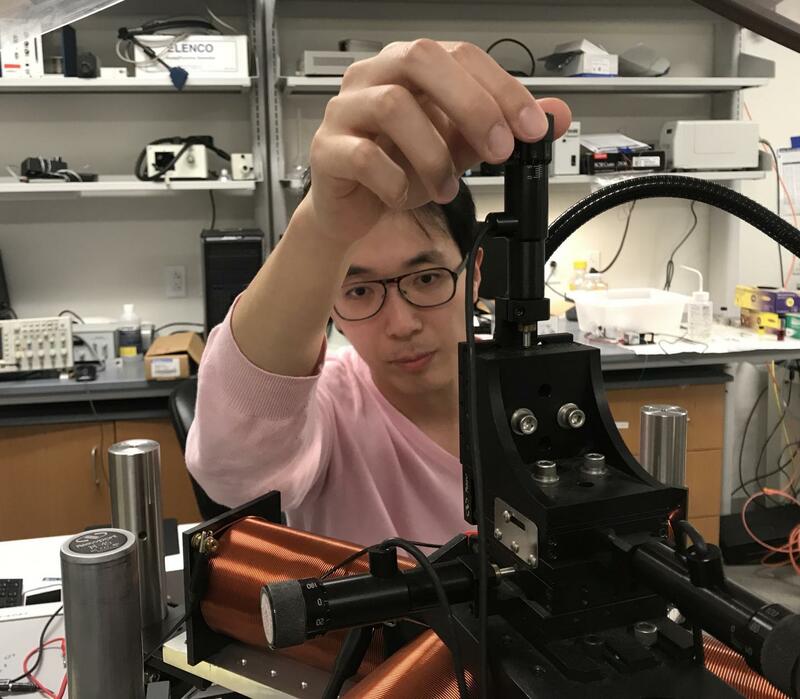 Rice alumnus and lead author Di (Daniel) Du discovered the swimmers while studying how paramagnetic colloidal particles respond to a rotating magnetic field, the subject of several recent papers by the Biswal lab. "One day I realized some of them swim," Du said. "I was very interested in this, so I looked into this specific locomotion phenomenon under low Reynolds number." A Reynolds number quantifies how objects move in fluids in relation to their viscosity, he said. "So if you see swimming, it means there's something going on. "We discovered that under some circumstances, especially under an eccentric magnetic field, these particles self-assemble into a swimmer and it becomes motive," Du said. Eccentric means the focal point of the rotating magnetic field is not the center of a colloid but moves around its circumference. In their experiments, the researchers found they could control the small particle's orbit by altering the power supply to four computer-controlled electromagnets that surround the solution. The particles are attached only by the magnetic field, giving the smaller one freedom to move in a swim-like motion with a long driving stroke and a short return stroke. The researchers called that a breaststroke because, like for human swimmers, the stroke does not require it to break the surface of the solution. To keep with the theme, Du called the large particles "torsos" and the small ones "arms." The swimmers' ability to move allowed him to claim they were even simpler than the "simplest possible swimmers" designed by Nobel laureate Edward Purcell. Purcell designed theoretical devices of three rigid rods connected by two hinges, each hinge representing one degree of freedom, and considered them to be the simplest configuration for a device that could swim "if you move the hinges in a specified way," Du said. "But ours is actually simpler," he said, "as I decreased the number of rigid components from Purcell's prototype." Du said experiments and simulations showed swimmers with multiple torsos and arms could be controlled, though their speed varied depending on the strength of the field and – in the simulations – on Brownian motion, the omnipresent, random push and pull of molecules in gases and liquids. In tests with multiple-particle swimmers, Du said, some arms would drift a bit further from the torso than others. Because this "arm fragmentation" influenced the swimmer's speed, it helped Du shake up theories about how particles respond to Brownian motion. "Only when there is Brownian motion do we see this fragmentation," he said. "With Brownian motion our simulations match experimental results; sometimes fragmentation drives the swimmers to swim slower, and sometimes faster. Without Brownian motion, there's a huge difference." Previous studies about the "scallop theorem" showed Brownian motion can influence the movement of things with reciprocating motion, like a scallop that simply opens and closes without propelling itself but still moves randomly. The arms in Du's swimmers move in a nonreciprocal way — the driving stroke is longer than the return stroke — but he showed their velocity is also influenced by Brownian motion. Du said it will be possible to attach ligands or proteins to the large particles for delivery to cells or other biological locations, and the entire vehicle could be moved with two magnetic coils at 90-degree angles. "In that way, swimmers could serve as micro-robots," he said. Rice graduate student Elaa Hilou is co-author of the paper. Du is a research statistical analyst at the University of Texas MD Anderson Cancer Center. Biswal is an associate professor of chemical and bimolecular engineering and of materials science and nanoengineering.